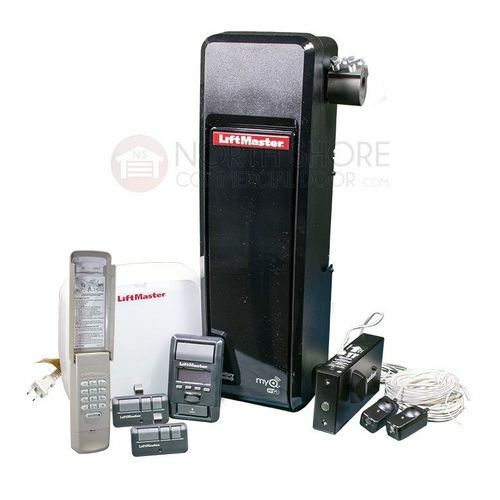 LiftMaster - Smart Home Elite Series 8500W Wall Mount Wi-Fi Garage Door Opener Smooth, Quiet Operation! Ordering instructions: LiftMaster operators are intended to be installed by an Authorized Dealer. Please contact us directly and we can recommend an Authorized Installing Dealer. For a quiet, space-saving garage door opener that is fully equipped with all the latest must-have features, get the Elite Series® 8500W DC Wall Mount Wi-Fi® Garage Door Opener by LiftMaster®, from North Shore Commercial Door! The LiftMaster 8500W (same as Chamberlain RJO20) is a COMPLETE garage control solution, designed to optimize overhead space. The innovative wall-mounted design opens up ceiling space for additional storage of bikes or bins. The ultra-quiet, yet powerful DC motor smoothly operates doors up to 850 lbs. while virtually eliminating noise and vibrations to adjacent living spaces. Control access to your garage door, receive notifications and set schedules from your smartphone or tablet using the MyQ® app with built-in Wi-Fi® connectivity. Security+ 2.0® remote control radio technology offers increased radio range and sends a new code with every click of the remote control. User-friendly interface for quick and easy setup! Simplified wiring enables more organized installation of plug-and-play accessories. Wires feed cleanly through the rear of the unit and the antenna is neatly hidden inside for a clean appearance. The LiftMaster® 8500W is FULLY-LOADED with other must-have safety and security features including auto-reverse sensors, timer-to-close function, and motion activated lighting. Doors that use a torsion bar and springs. The torsion bar must be 1" (2.5 cm) diameter. NOT compatible with reverse wound drums. 4-6" (10-15 cm) drums, not to be used on tapered drums over 6" (15 cm). High lift (10-15 cm) drums, not to be used on tapered drums over 6" (15 cm). High lift (up to 54" (137.2 cm) high) and standard lift sectional doors up to 14 ft. (4.3 m) high. Doors up to 18 ft. (5.5 m) wide. Doors up to 180 sq. ft. (16.7 sq. m). Review or inspect proposed installation area. The door opener can be installed on the left or right side of the door. Select the side that meets the following requirements. Must have a minimum of 8.5" (21.6 cm) between the side wall (or obstruction) and the end of the torsion bar. The torsion bar must extend at least 1.5" (3.81 cm) past the bearing. This may vary depending on your installation requirements. An electric outlet is required within 6 ft. (1.83 m) of the installation area. If the outlet does not exist, contact a qualified electrician. Depending upon building construction, extension brackets or wood blocks may be needed to install safety reversing sensors and cable tension monitor. Alternate floor mounting of the safety reversing sensors will require hardware (not provided). Check the seal on the bottom of the door. Any gap between the floor and the bottom of the door must not exceed 1/4 inch (6 mm). Otherwise, the safety reversal system may not work properly. Ultra-quiet, yet powerful DC motor smoothly operates doors up to 850 lbs.